The Turnbull Government has promised to deliver a national apology to survivors and victims of institutional child sexual abuse, and their families, later this year, as part of its official response to the royal commission. Source: The Australian. The Royal Commission into Institutional Responses to Child Sexual Abuse delivered its findings late last year, giving the commonwealth, state and territory governments six months to respond. Of the 409 recommendations made, 122 fell wholly or partially under the Commonwealth’s jurisdiction. “We’ve already acted on many of the recommendations of the commission, but today, we accept or accept in-principle 104 of the remaining 122 recommendations directed wholly or in part to the Australian government,” Prime Minister Malcolm Turnbull said. 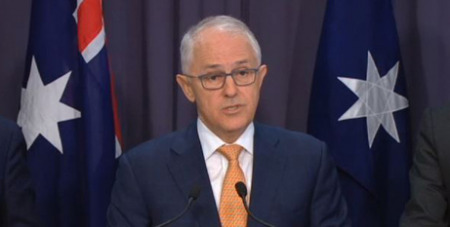 Mr Turnbull announced a new federal office to monitor child safety and said he would deliver his national apology on October 22 to coincide with National Children’s Week. He has formed a national apology reference group to ensure the apology meets the expectations of survivors. “Now that we’ve uncovered the shocking truth, we must do everything in our power to honour the bravery of the thousands of people who came forward,” he said. On the question of the seal of the confessional, Mr Turnbull said the safety of children must come first, but he acknowledged it was largely an issue for the states to determine and Attorney-General Christian Porter would be talking to the states to try and ensure a harmonised outcome. Australian Catholic Bishops Conference President, Archbishop Mark Coleridge, welcomed the government’s response to the royal commission , including measures to standardise approaches to child safety and research to help prevent child sexual abuse in the future. “The Catholic Church has already begun its work to respond to the recommendations of the royal commission. Some of those responses began during the course of the royal commission,” he said. “Across the country, child safeguarding offices have been established or strengthened in dioceses, archdioceses and other Catholic organisations to streamline and centralise work on protecting children and young people in Church settings. Archbishop Coleridge said the Catholic Church was the first non-government institution to join the national redress scheme on the national level and is firmly committed to providing redress to survivors who were abused in Catholic settings. “The Church also has established the Implementation Advisory Group, made up mostly of lay people, which is helping the bishops decide how to respond to the royal commission,” he said. “Regarding the issue of the seal of confession, the Catholic Church does not view the sacramental seal as incompatible with maintaining child safety,” he said. Archbishop Coleridge said the Church would continue to work with government to ensure both protecting children and upholding the integrity of Catholic sacraments could be achieved and maintained.